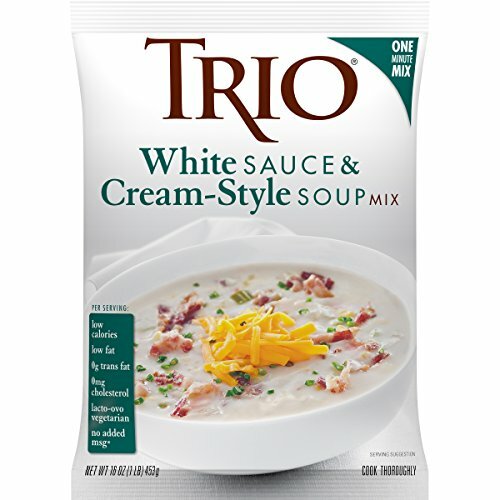 The subtle, savory flavor of this versatile trio white sauce is a great starting point for cream soups or a variety of unique sauces. Spoon it over grilled vegetables or fish tacos for a creamy topping, or blend it with cheese, seasonings and other ingredients for an indulgent manicotti. Create your own roasted garlic or mushroom sauces for fish, poultry or vegetables. Quality sauces and gravies don’t have to take long. At least not with trio. In moments, you have several options on hand to serve, broaden your current offerings, or customize. The quality is trustworthy. The flavor is dependable. And the performance is consistent. Every time, in no time. Open. Pour. Stir. Done. If you have any questions about this product by Trio, contact us by completing and submitting the form below. If you are looking for a specif part number, please include it with your message.